I love lamb at this time of year – very tender and full of flavour. 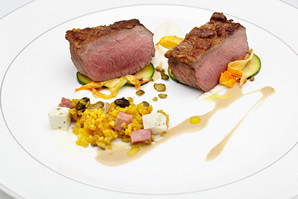 Lamb doesn’t need heavy accompaniments, especially in the summer months, so a little saffron cracked wheat and salty sheep’s milk Feta make a perfect match. It’s best to cook and rest lamb saddle on the bone where possible to keep the meat lovely and moist. Bring it out of the fridge and pat it dry well in advance so it can come up to room temp for even cooking. In a wide, shallow casserole over a medium heat pour a generous layer of olive oil. Add the chopped shallot and cook, stirring until translucent but not browned. Pour in the wheat and mix to coat with the oil. Toast the grains in the oil until they puff a little and pale slightly. Add the chilli flakes to taste, a generous pinch of saffron, the bay leaf and salt. Next pour in the stock (carefully – it will bubble!) until just 30% higher than the depth of the wheat. Bring to a boil then cover loosely and reduce the heat to very low. Cook until tender and all the stock has been absorbed – about 25 minutes. Leave to rest in the pan. Rub the saddle with a little oil and season generously with salt and pepper. Roast in a large, heavy bottomed tray for 30 minutes for a nice pink, but not rare, lamb. Set the lamb aside in a warm place. It’s very important to rest the lamb for as long as possible on the bone – a good rule of thumb is to rest meat for as long as it’s been cooked. Pour off the majority of the fat from the tray and place on a moderate direct heat. Sweat the shallots in the fat, scraping off the sugars caramelised at the bottom of the pan. Pour in the wine, turn up the heat and reduce the wine until syrupy. Add the stock and reduce again until thickened then pass through a little sieve into a jug. Whisk in a little best quality olive oil and a squeeze of lemon. Wash and cut the courgettes into coins and sweat in the butter for a few minutes until just tender, then tear in the courgette flowers to wilt. Off the heat throw in the diced feta. Return the cracked wheat to the stove to heat through and fluff up with a fork. Fold in the pistachios, raisins and coriander and a squeeze of lemon juice and salt if needed. Reheat the saddle for about five minutes in the oven, just to get some heat back into it. Carve the loins from the bone (not forgetting the fillets on the underneath) and serve immediately with the courgettes, a big bowl of cracked wheat and plenty of the sauce on the side.